Order your EarthQuaker Devices Aqueduct Vibrato from AMS and enjoy 0% Interest Payment Plans, Free Shipping, Free Extended Warranty & 45 Day Money Back Guarantee. The Aqueduct Vibrato produces a rich tone that is warm and expressive. Welcome to your EarthQuaker Devices Aqueduct Vibrato! Aqueduct uses a short delay line with eight different methods of modulation to deliver gentle rolling pitch-wobbles, steady kosmiche pulsations, rapid trills, slimy sonic squiggles, whammy bar wiggles, and anything else your pitch-warped brain can picture in your murky mind’s eye. The controls are simple. Rate adjusts the LFO speed which controls how quickly the pitch rises and falls. Depth controls the LFO amplitude, adjusting the intensity of the vibrato effect. The rotary switch labeled Mode selects between one of eight LFO waveshape and envelope combinations which drastically alter the character of the modulation and make Aqueduct adaptable to nearly any musical situation. The smoothest and most subtle of all waveforms, sine waves are most commonly associated with classic amp-like vibrato. Plug in, turn on, and commence the Chooglin’. Triangle waves have a sharper rise and fall than sine waves with a more pronounced pitch bend at the peak of each LFO cycle. Like a triangle wave with a twist. The Ramp waveform has a sharp sonar pulse followed by a rapid downward slope with a synthesizer-like sustain and release. This is where things start to get a little weird. Square waves are the most rigid and abrupt of the waveforms. Rather than gliding smoothly between pitches, square waves produce an instant on-or-off transition between notes. Use this mode for trills when you get tired of doing hammer-ons and pull-offs. This waveform isn’t a waveform at all as much as it’s a drunken master of modulation who slurs your notes into an unpredictable assortment of greasy pitch-bends before disappearing at last call and leaving you stuck with the tab. It has a "warped record" effect at low Depth settings and becomes sloppier and more randomized as you increase the Depth control. This is Envelope-Controlled Depth mode. The waveshape is set to a sine wave, the speed of which may be adjusted using the Rate control. The Depth control sets the sensitivity of the envelope - the point at which the effect kicks in as you play. In this mode, your pick attack sets the intensity of the modulation. The harder you dig in, the more pronounced the effect. Try it during your next motorik jam. This is Envelope-Controlled Rate mode. In this mode, the input level (i.e. pick attack) controls the LFO rate. Play harder for faster modulation or lay low for slower modulation speeds. The Rate control adjusts the sensitivity of the envelope. Depth selects the LFO intensity. This is Envelope-Controlled Pitch mode, which we’ve lovingly nicknamed "The My Bloody Valentine setting." If your instrument doesn’t have a tremolo bar, it does now. In this mode, the frequency modulation is controlled by the dynamics of your pick attack and not the LFO. Do yourself a favor and try this one. Power: This Device should be powered by a standard 9-volt DC power supply with a 2.1mm negative center barrel. We always recommend pedal-specific, transformer-isolated wall-wart power supplies or multiple isolated-output supplies. Pedals will make extra noise if there is ripple or unclean power. Switching-type power supplies, daisy chains and non-pedal specific power supplies do not filter dirty power as well and let through unwanted noise. Do not run at higher voltages! The greatest tremolo of all time. The sounds you get out of this pedal is phenomenal. The various settings go from subtle to outrageous. Must have for your pedalboard. My experience is that you never know when you'll need a certain sound. The Swiss Army Knife of tremolo pedals. 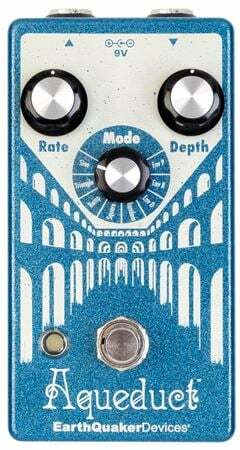 I love modulation pedals and Im always looking for one that will stay on my board. This pedal provides so much diversity and allows me to really add some color to my guitar tone. Im always buying/selling pedals and let me say that this one is a keeper. Good purchase! This pedal blew my mind and continues to do so every time I step on it.This stomp box inspires! I play guitar more often because of this pedal. EQD makes some of the most solid pedals out there and this one will make dreams come true. Watch the reverb video of Andy showing this off and tell me you’re not drooling over it.